YALEZOU, Guinea – A large crowd of community leaders including the deputy Superintendent (Sub Prefect), Police and Military commanders, gathered at the Yalezou border checkpoint to welcome the General Manager and delegation to Guinea as the tour of CLSG project sites continued. Scores of parents, friends and community members patiently waited for the delegation and as the convoy emerged from the vast dust, the Sub Prefect, Youssouf Fofanah and his team lined up to receive the TRANSCO CLSG General Manager, Mohammed M. Sherif. “This is very exciting…” the GM said. The show of support for the CLSG project in Guinea is overwhelming. The community awaits patiently for the coming of the affordable and reliable electricity to their town. Yalenzou is a town and sub-prefecture in the Nzérékoré Region of Guinea. It is located southeast of Nzérékoré near the border with Liberia. The town of Nzao, the official site of the TRANSCO CLSG substation, lies between Yalenzou and Nzérékoré. From the border, the TRANSCO CLSG delegation was accompanied to Yalenzou town center where another group of residents awaited to meet the TRANSCO CLSG team. At an indoor meeting, the people of Yalenzou welcomed the General Manager and presented him cola nuts. They extolled the management of TRANSCO CLSG for the hard work in bringing reliable and affordable electricity to their community and the country at large. “We are in darkness here but we are very happy for the CLSG project coming to our town….” Sub prefect Fofannah said amidst cheers. 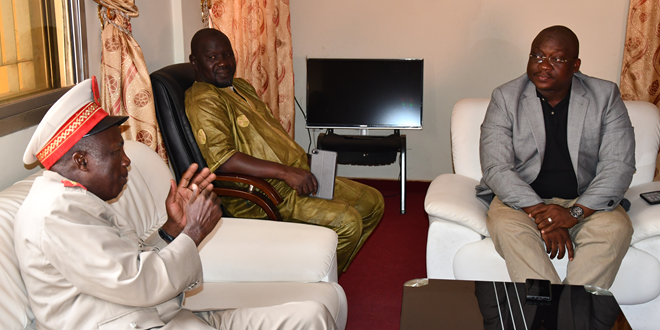 The meeting in Yalenzou was a prelude to a much high-profile union with the Superintendent (Prefect) of Nzerekore, Sory Sanoh, who formally welcomed the General Manager and team to his town. He expressed joy for the CLSG project.